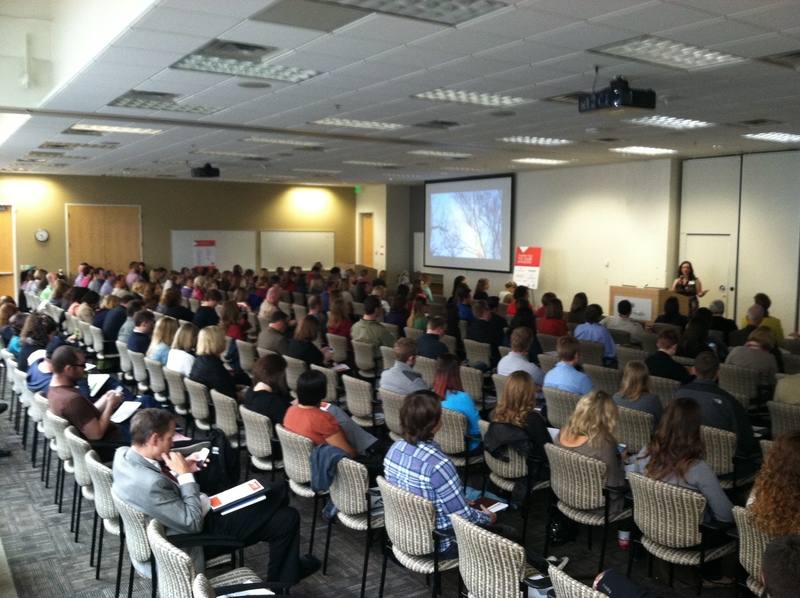 Does Minneapolis need a digital marketing awards show? 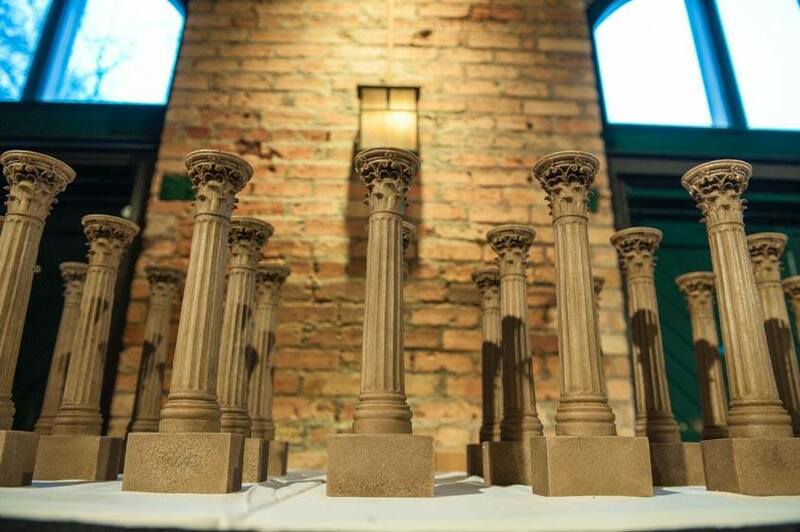 A couple weeks ago MN PRSA held its annual Classics Awards. I didn’t attend this year, but most years I make an effort to go Not because I submit an award entry (as a solo, that’s rarely worth it, in my opinion), but because it’s like a big ol’ reunion. TONS of people and friends from the PR world that I rarely see are there. For one night, I can see all these folks in one place. For agencies and corporations, this event gives them a chance to shine. To win a coveted Classics Award. Don’t think that matters? Go to the event and see the people yelling and screaming and then tell me it doesn’t matter. Award shows like this matter–maybe not so much to the agencies themselves (I mean, which agency HASN’T won a Classics Award by this point? But, that’s a separate rant for a separate time), but much more so for the people that help work on the accounts and put the award submissions together. It’s a point of pride. It’s the one night we actually get recognized. Again, it’s an awesome night. 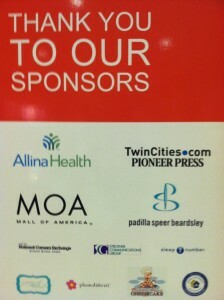 Yet, the digital marketing world in Minneapolis/St. Paul doesn’t have a program like this. Yeah, I know. PRSA, Ad Fed, AMA, IABC. They all touch on digital marketing. Most of them have a few awards devoted to this discipline. But, they merely scratch the surface. I’m talking about an awards program exclusively devoted to digital marketing. One that would focus on things like UX, social strategy, and SEO campaigns. I mean, it would be pretty geeky. But, that’s digital marketing, isn’t it? We all know New York sees us as fly-over country. But, we know better. A lot of people know better. Minnesota is home to some of the best digital marketing talent in the U.S. So much great work comes out of this community. Think about it. The recent space150/Victory Oculus Rift implementation. The #lillyfortarget social launch. I could go on and on. Sure, these campaigns are highlighted in an industry rag every once in a while, but rarely to they win actual awards where they’re recognized by their peers. I don’t know if you’ve heard, but digital marketing is kinda trending right now. 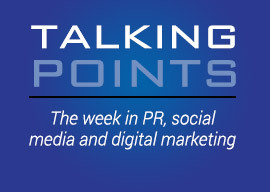 Think about some of the coolest work going on right now–it’s happening in digital marketing! Yet, we don’t have a mechanism to formally recognize this work here in town. The challenge with an exclusively digital marketing awards show is “would it really include that many categories?” I mean, you wouldn’t have a “best Facebook page” category, right? So, we’re only talking about a smaller number of awards. Campaign of the year. Web site of the year. Digital marker of the year. That kinda thing. It probably doesn’t need to be the blow-out event Classics is. But, it feels like we could do something. So, given all that, what do you think? 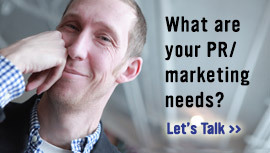 Do we need an awards program devoted to digital marketing here in Minneapolis? Note: Photo courtesy of Minnesota PRSA. OK, so I’m going to write this post like I would if I were trying to sell my boss on sending me to MIMA Summit. Because, realistically, that’s what I hear a lot. Full disclosure: I’m on the MIMA board of directors, so it’s in my best interest to get as many people to Summit as possible 😉 But, in reality, this has been a great event historically and I think many people in the Minneapolis/St. Paul area would agree with that sentiment. In fact, I’ve heard from many people that Summit is the best digital event in the Upper Midwest. This year, you’ll learn about wearable technology, marketing automation, design, paid media strategies and much more. As usual, there’s almost something for everyone at Summit. And, this year’s theme (internet of things) is a topic on everyone’s mind these days. And while the keynote speakers might not be household names like Guy Kawasaki, they’re absolutely leaders in the internet of things sector. Here’s your chance to really beef up your understanding of that space. Maybe one of the biggest reasons I got more involved with MIMA is they were one of the few organizations in town bringing in national, well-known speakers on a regular basis. Chris Anderson, Jane McGonigal, Nate Silver for example. I mean, the list goes on and on. In fact, this Wednesday we’re bringing a leading developer from Sony Playstation to town. MIMA may be one of the only orgs in the Twin Cities that’s doing this routinely–and you’re going to see it in spades at MIMA Summit. There’s a reason the recruiting firms in town are some of our sponsors at Summit. Smart firms/leaders know that since MIMA Summit is a digital marketing reunion of sorts, that this is a great place to nurture relationships–especially if you’re seeking new talent. Now, I don’t hire talent, but I will tell you I hear about who’s looking and who’s happy a lot at Summit each year. And, keep in mind, Summit tends to attract those “over-achiever” types–you know, the types who are going to be senior VPs in 7-10 years? Yeah, you’ll find those people at Summit typically. I was involved with PRSA for years. 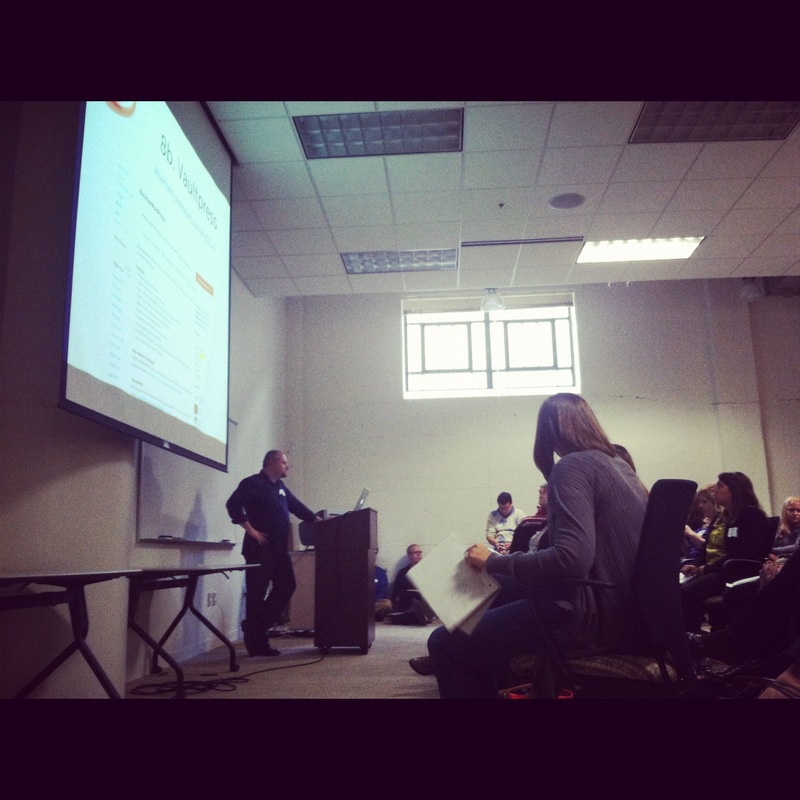 And, as part of that involvement, my favorite event of every year (and really, still is) was the PRSA Classics. For those outside the Twin Cities, this is our version of the Silver Anvils. But, it’s really much more than that. It’s a PR reunion, of sorts. I see people at Classics each year that I don’t see all year long. It’s my one chance to catch up with them. And I take full advantage. It’s really the primary reason I still attend–especially now, when, as an independent, I would never really submit an entry. MIMA Summit is the same way. It’s the Minnesota interactive community reunion. Your chance to see EVERYONE in one spot for one day. So, hope that helps you sell your boss. I know it’s an investment, but I believe it’s worth it. And, I think after really evaluating your options, I believe you will, too. For now, I hope you’ll consider attending. Register today and you’ll get in for just $500 for members and $650 for non-members (after today it bumps up to $600 for members; $700 for non-members). When you think about what you get–a full day of rock solid content, learning and networking–I think that’s a heckuva deal (and I’d say that even if I wasn’t attending as a board member). Four years ago, Missy Berggren and I started the first conference in Minnesota solely devoted to Minnesota bloggers: The Minnesota Blogger Conference. We started the event because we saw a need (at the time): to help bloggers from different walks of life, who blog about different topics, come together and learn from each other. And, to be honest, just to network and get to know one another. With the help of many, many people, we’ve pulled off four #mnblogcon’s. It’s been exhausting. Fulfilling. Time-consuming. Informative. And most of all, a heckuva a lot of fun. But, our run has come to an end–well, for now, at least. Last year, Missy signed on with WCG here in Minneapolis. She also joined the board of directors for the Food Allergy Support Group, and signed on as a key member of the planning team for the local Social Media Breakfast chapter. 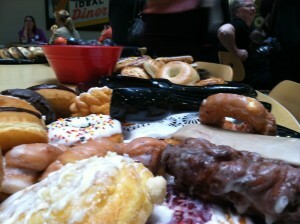 All this meant fewer hours to devote to labors of love like #mnblogcon. Enter Mykl Roventine and Jen Jamar. Missy and I have known Mykl and Jen for years. Big contributors locally. Bloggers in their own right. And great people. 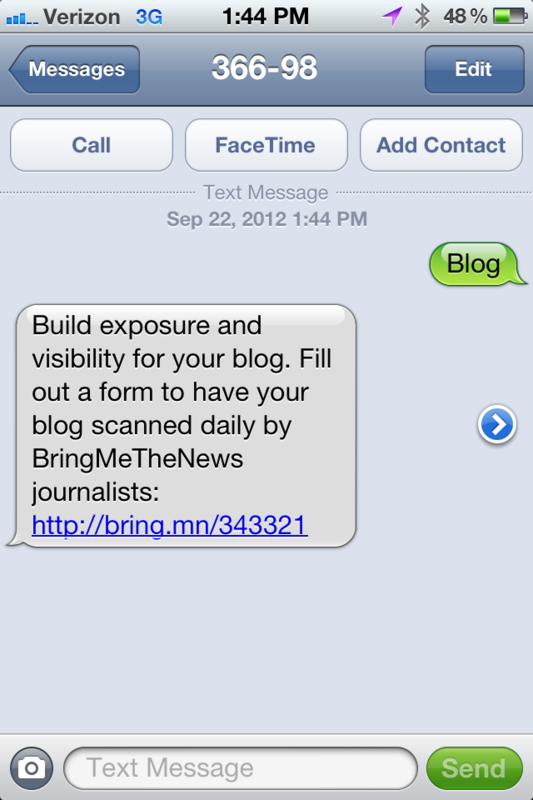 When they showed an interest in taking the #mnblogcon reigns, we couldn’t resist. We wanted #mnblogcon to live on–after all, we’ve seen tremendous demand for the event, and continue to field inquiries about this year’s #mnblogcon. So, naturally, we wanted to secure its future. With Mykl and Jen leading the way, Missy and I are extremely confident #mnblogcon will be on the right path. Missy and I will still be involved in advisory roles, but Mykl and Jen will be handling all the day-to-day and planning details. In essence, #mnblogcon is now Mykl and Jen’s baby. But Missy and I plan to be at #mnblogcon this fall. We wouldn’t really miss it for anything. So, I hope you’ll join me in welcoming Mykl and Jen to the #mnblogcon family and wishing them the best of luck with this year’s event. PS: If you’re interested in volunteering to help with #mnblogcon, or you’re interested in sponsoring, please contact Mykl at myklroventine@gmail.com. Look for more details on the event at www.mnbloggerconference.com. A couple weeks ago, a client of mine (Fortune 500 company) that works in the digital realm asked the following: “Wondering what conferences I should attend this year–any ideas?” Easy question, right? But sadly the answers aren’t as easy. With a complete overload of “social media” and digitally-based events, it’s not surprising corporate folks have a tough time separating the wheat from the chaff when it comes to these kinds of events. Most corporate folks are looking for events where they can: 1) Learn about a specific skill set (Facebook advertising, analytics, etc.) where they may be a bit weak, and 2) Learn from other large organizations just like them. If you’ve worked with big corporate teams, you know they have far less interest in hearing a noted “though leader” speak than they do someone from another Fortune 500 company. It’s all about relevance. The thought leader might have good ideas. They might be smart. Heck, they may even have the perfect idea for the corporate person to execute–the one that helps them achieve those elusive goals for the year. But the corporate person wants to hear from a peer 9 times out of 10. Ok fine, 10 times out of 10. It’s not an opinion–ask your corporate friends. 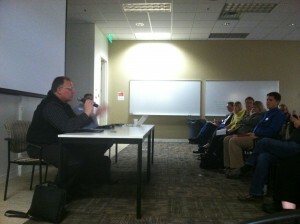 A number of year ago I attended my first and only BlogWell event at General Mills here in Minneapolis. It remains, to this day, one of my favorite social events. Why? 1) Because the sessions are quick–45 minutes or less. And, 2) Because big brands are represented en masse. In fact, it’s ALL big brands like Wal-Mart, McDonalds and Walgreens sharing case studies and best practices with each other. Right from the trenches. The lineup in New York does not disappoint either–the brands lined up include: Walgreens (Disclosure: former client), Wendys, Wal-Mart, Verizon and Corning. Probably the number-one event I’d suggest big brand folks attend if they haven’t already. Oh, and by the way, the fee for the one-day event is only $250–not the thousands of dollars you’ll pay for other social media events. Admittedly, I don’t know all that much about this event. Never been. But, take a peek at the speaker list–it’s an impressive list of corporate CHIEF MARKETERS. When was the last time you saw that kind of lineup? Not very often. 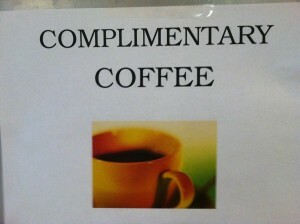 And that’s why I’m guessing corporate folks flock to this event. You’ll have the chance to hear from the CMOs of Mastercard, Hertz, Sears/K-Mart, FootLocker, and Outback, among many others. On Saturday, we held the third-annual Minnesota Blogger Conference at Allina Commons in Minneapolis. 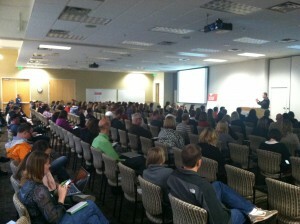 More than 200 bloggers showed up to learn and meet other bloggers from Minnesota. We heard from people like Julio Ojeda-Zapata who talked about how to use Google+ as a blogging platform. We heard from our keynote, Rick Kupchella, as he talked about the future of news media–and how bloggers fit in. And, we heard from Mykl Roventine about plug-ins that can help your WordPress blog run a little more smoothly. Of course, there were many other sessions and highlights–that’s just a taste. But, I thought I’d share with you my experience at the Conference in photos. See below. Hope to see you at next year’s Conference! Morning came early on Saturday–but these tasty pastries (see what I did there?) made it a bit easier. 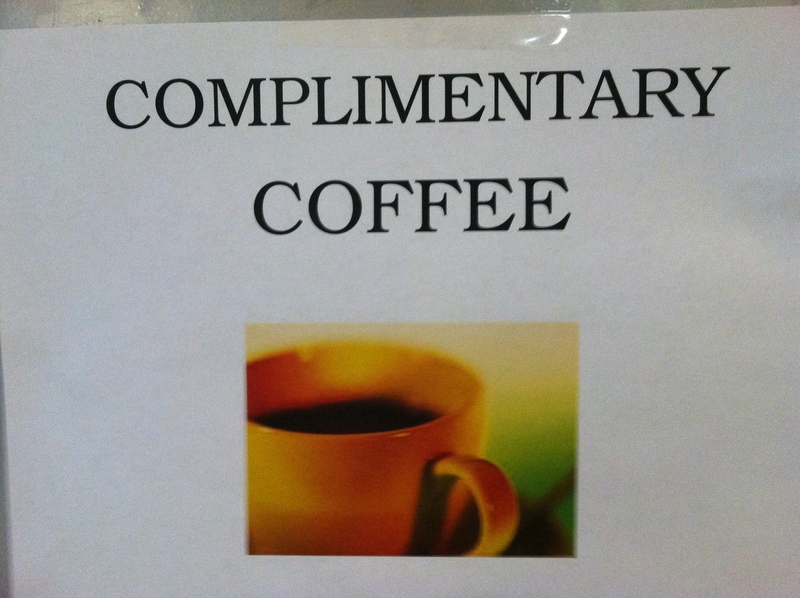 Complimentary coffee was one of the many perks made possible by our generous sponsors. 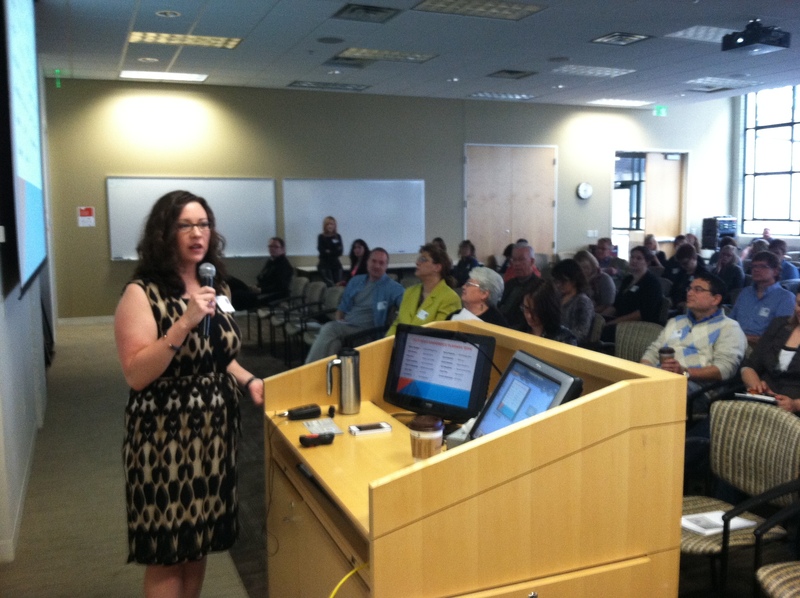 My wonderful co-host/founder, Melissa Berggren kicks things off in the morning lead-off session. 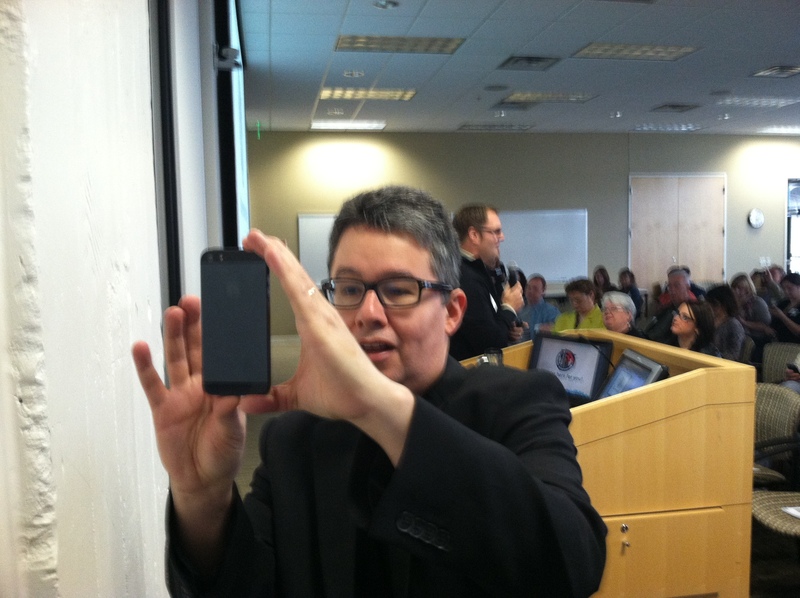 One of my favorite shots of the day–me taking a photo of Julio Ojeda-Zapata taking a panaromic photo with the new iPhone 5 (very meta). Full house for the morning kick-off session. 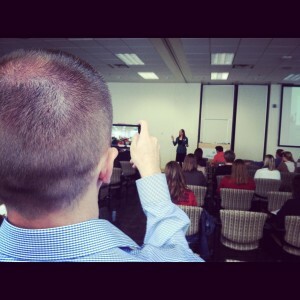 Friend, Paul DeBettignies (@mnheadhunter) taking a quick pic of Lauren Melcher’s presentation on blogger relations. Big turnout for our keynote presentation from Bring Me The News’ Rick Kupchella. 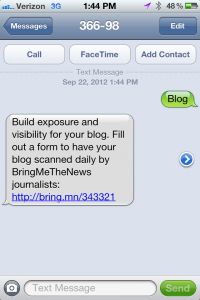 MN bloggers: Send a text with “blog” in the message line to “366-98” and you can fill out a form for your blog to be reviewed as a potential source for Bring Me The News. My view from the floor (it was packed!) at Mykl Roventine’s plug-in session. Our closing keynote of the day featured Steve Borsch (in the foreground), Patrick Rhone and Albert Maruggi discussing the merits of podcasting. 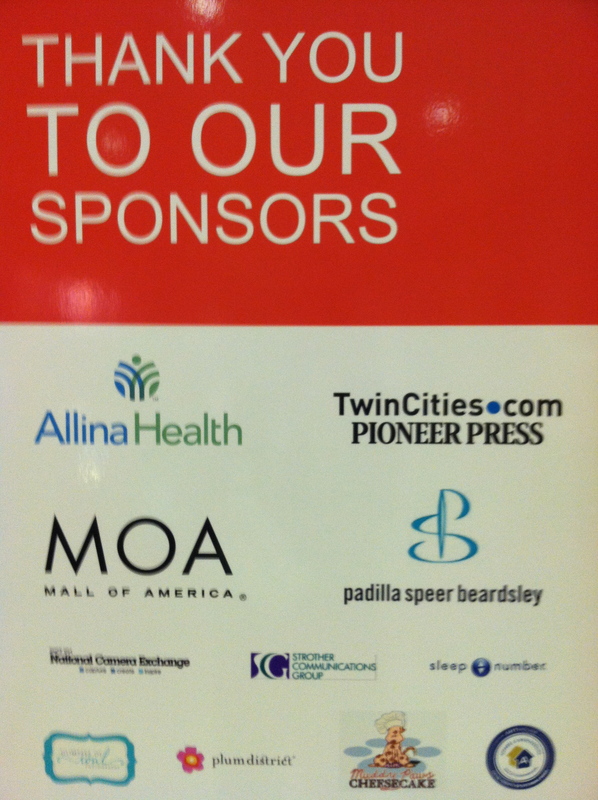 The Minnesota Blogger Conference simply doesn’t exist without the support of our fantastic sponsors. Thank you!